The three-time Olivier Award winner and current BAFTA nominee, Alex Jennings (My Fair Lady, Charlie and the Chocolate Factory. The Queen, Bridget Jones: The Edge, Babel, The Lady in the Van and most recently the critically acclaimed Netflix series The Crown and Unforgotten for which he has been nominated for Best Supporting Actor) will complete the cast for the London premiere of the acclaimed Broadway musical The Light in the Piazza. A stunning story about the life-changing thrill of first love, Jennings will play Signor Naccarelli the father of dashing Italian lover, Fabrizio. He will be joining the exceptionally talented cast led by opera superstar and four-time Grammy winner and Tony nominee Renée Fleming who is making her London musical theatre debut as American Margaret Johnson and Disney Film and Emmy-winning TV star Dove Cameron who is also making her UK debut as Margaret’s troubled daughter Clara. Dove is best known for her role in Disney’s The Descendants trilogy. In addition, she recently played the role of Amber von Tussle in NBC’s Hairspray Live! and starred as Cher in the Off-Broadway production of Clueless: The Musical. Also appearing are West End star Rob Houchen (Marius in Les Misérables and named Best Male in a Musical at the 2019 Off West End Awards for his performance in Eugenius), who will play Clara’s suitor, Fabrizio Naccarelli, and Celinde Schoenmaker (female lead in The Phantom of the Opera as Christine Daaé, and Fantine in the West End production of Les Misérables) as Franca Naccarelli. Malcolm Sinclair (who is currently nominated for an Olivier Award and whose career onstage and screen spans more than three decades encompassing a vast array of West End, National Theatre and RSC productions alongside roles in films such as Casino Royale and V for Vendetta) will play Margaret’s husband and Clara’s father Roy Johnson. Fabrizio’s mother Signora Naccarelli will be played by leading operatic soprano Marie McLaughlin (Le nozze di Figaro, Don Giovanni, La bohème, The Greek Passion and Falstaff). Playing Fabrizio’s brother Giuseppe is Liam Tamne (The Phantom of the Opera, Link Larkin in Hairspray and Frank N Furter in the Rocky Horror Show). The talented ensemble includes Simbi Akande, Danny Becker, Jordan Castle, Nicholas Duncan, Chlöe Hart, Molly Lynch, Rhona McGregor, Tom Partridge, Monica Swayne and Matthew Woodyatt. 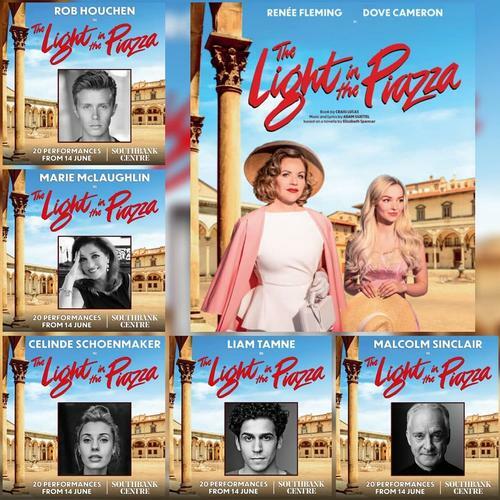 Based on the novella by Elizabeth Spencer, The Light in the Piazza is written by Craig Lucas, with music and lyrics by Adam Guettel. Set in Florence during the summer of 1953, it’s a touching and heart-wrenching love story with music described by the New York Times as “the most intensely romantic score of any musical since West Side Story”. The Light in the Piazza’s rich, emotional score is totally unique genre amongst Broadway musicals. Unapologetically lyrical and romantic, it transports us into the world of Margaret Johnson and her daughter Clara, as they take in the wonders of Florence. A fateful gust of wind whisks Clara’s hat into the hands of local dreamer Fabrizio Naccarelli and it’s love at first sight. However, Clara isn’t quite what she appears and soon they must all confront a secret that’s been kept in the shadows for far too long. The Light in the Piazza will be performed in a specially-designed full theatre staging at the Royal Festival Hall for only twenty performances from June 14th, with the 34-piece Orchestra of Opera North providing a unique opportunity to hear the wonderful score . The production will be directed by multiple Olivier Award-winner Daniel Evans, music director is Kimberly Grigsby (who performed the same role on the original Broadway production), set is designed by Robert Jones with Brigitte Reiffenstuel providing costumes evoking the inimitable style of the 1950s. It is produced by John Berry and Anthony Lilley for Scenario Two Ltd.